I’ve always loved animals. This love isn’t exactly unusual in young children, but my fascination and curiosity about animals has not wavered. Among my earliest memories as a toddler was catching turtles in my backyard because they were slow enough for me to grab. As I got older, I started reading everything I could about animals, starting with lions (like many kids who grew up in the ‘90s, I was enthralled with The Lion King—except in my case, the movie became a recurring theme in my life). While learning more about lions, I realized that I thought their family groups were fascinating! I moved on to reading everything I could about other animals that lived in family groups, which grew into an interest in animals that live in larger groups with complex relationships like bottlenose dolphins and orcas. 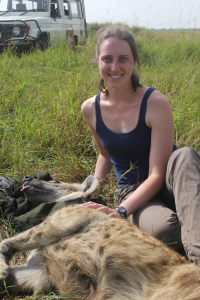 When deciding what to do after college, I knew I wanted to study animals with complex social interactions and came across a program that studied spotted hyenas in Kenya. Prior to learning about this program, the most I thought about hyenas was watching The Lion King. I figured that the portrayal of hyenas couldn’t be right—as wonderful as the movie is, it is not renowned for its biological accuracy. I started reading obsessively about a new species and found that hyenas are so cool! They live in groups called clans that consist of multiple families reaching up to 130 members. Like humans they live in fission-fusion societies which means that, though they’re all in the same clan, the individuals they associate with change as hyenas come together or split apart to be alone or join other individuals (Kruuk, 1972). Their societies are as complex as certain baboon species and vervet monkeys, which is rare to see in non-primate species, especially carnivores (Holekamp, Smith, Strelioff, Van Horn, & Watts, 2012). As it turns out, these social traits make hyenas a great animal to study if you’re interested in how lots of individual little interactions like greetings, aggressions, and hanging out go together to form a cooperative social group, otherwise known as sociality in animals. I am studying a small part of sociality, specifically how sociality develops in growing hyena cubs and what that means for them throughout their lives. Sociality, especially complex sociality, is surprisingly difficult to understand and even to observe. For instance, imagine you’re at work with your officemates or in a class of 100 people. You might have a general idea of who hangs around with whom, but would you know how often everyone associated with everyone else in the group? Could you name each person’s friends? Shelly may be friends with Max, but does Max consider Shelly a friend in return? Is anyone actively avoiding someone else? In studying humans, at least researchers can conduct interviews or give people surveys. So, assuming people are answering truthfully, these challenges are difficult but manageable. Now imagine that you want to be able to address these questions in an animal that doesn’t speak any language you may know or could easily learn (though we have researchers trying to learn how hyenas communicate right now). One method scientists use to try to tease apart and try to explain complex relationships is using social network analysis (SNA). A social network isn’t just Facebook. A social network is a group of individuals or entities (businesses, classes, etc.) that are connected by relationships or interactions (associating together, being friends, writing papers together, etc.). 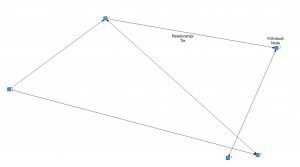 Individuals are represented by nodes; relationships and interactions are depicted by lines between the nodes called ties. Figure 2. 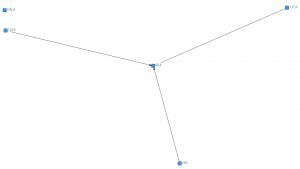 Random network graph. Blue squares are nodes that represent individuals or other entities. The lines are ties that indicate which nodes are connected by a relationship. 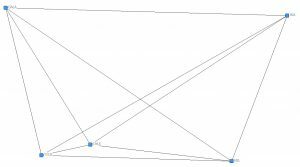 Social network graphs, such as the one just described, help us visualize relationships that may be difficult to see simply by observing. These graphs are especially helpful with animals when we only can use observations of behavior to understand relationships and cannot rely on interviews and surveys. Figure 3. A picture of a typical hyena interaction with their names. Here we have five hyenas in a session together where three individuals are acting aggressively towards another, and GALA is off to the side doing her own thing. Figure 4. Undirected association network of the illustrative hyena interaction. Or relationships can be directed, for instance, when one hyena acts aggressively to another, as when HEL, CHLE, and TICA are aggressive to IKA. Figure 5. Directed aggression network of the illustrative hyena interaction. The direction of the arrow indicates who is being aggressive to whom. Once relationships are graphed, we analyze aspects of these social relationships statistically through SNA. We can learn things like if one clan of hyenas is bonded by stronger relationships than another, or how one individual’s social role varies from another. I’m using SNA to look at how individual hyenas learn their social role or position in the clan and how that position then affects aspects of their life like their personality or longevity. We already have evidence that cubs “inherit” their mothers’ social network (Ilany & Akcay, 2016), but what does that mean for the cubs’ development? These questions are examples of what we are currently exploring in spotted hyenas. Learning more about the social lives of hyenas helps us to see that hyenas are much more than “nothing but slobbering, mangy, stupid poachers” (I just had to bring it back around to The Lion King). Holekamp, K. E., Smith, J. E., Strelioff, C. C., Van Horn, R. C., & Watts, H. E. (2012). Society, demography and genetic structure in the spotted hyena. Molecular Ecology, 21(3), 613–632. Ilany, A., & Akcay, E. (2016). Social inheritance can explain the structure of animal social networks. Nature Communications, 7, 1–10. Kruuk, H. (1972). 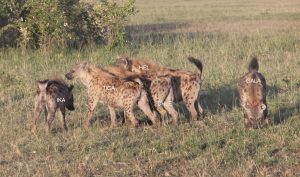 The spotted hyena: a study of predation and social behavior. This entry was posted in BEACON Researchers at Work and tagged BEACON Researchers at Work, hyenas. Bookmark the permalink.